You spend hours and hours painting up your 40K army, so keeping it protected makes perfect sense. Enter foam trays for Warhammer 40K – the easy way to protect your models. Below I’ll go over various companies that make foam trays for 40K and let you decide which one works best for you. The trays for Warhammer 40K will vary from pluck foam to pre-cut/laser foam, and also offer a wide range of price points from affordable to expensive. The king of the foam world these days, Battle Foam. You can have them design a tray for you, buy custom pre-cut foam trays, or buy more generic square slotted trays. You won’t find another company with more options than Battle Foam. I can’t even begin to cover them all in this article, but I’ll give you some solid options at least. These are the big trays that fit into the P.A.C.K bags that Battle Foam offers, like the PACK 720. Also, these are pluck trays. You can snag a 15.5 x 12 x 1 inch tray at a good price considering how much you can fit into it. There’s also a 2 inch version of the same tray, and a 3.5 inch version as well. Speaking of the P.A.C.K bags, you could also go that route and snag a bag with the foam trays in it. The P.A.C.K 720 is a very popular bag that Battle Foam carries. If you’re unfamiliar, the 720 in the name designates that it can hold up to 720 models. So, that’s a lot of model capacity for the price. There’s a good chance this will carry your entire Warhammer 40K army with ease. Here’s a video from Battle Foam showing off the 720 bag. Citadel has a range of cases available, all packed with their custom channel foam trays, which is pretty awesome. So, you can’t just get the foam trays, you have to buy the entire Warhammer 40K carry case. Here’s a nice short video they did showing them all off. You can see how easy it is to store your miniatures and take them out. A note on the two tier channel foam trays. The way these work is that one foam trays fits inside another; it stacks inside it. So, that top-tier protects the models in the lower tray. Typically, the lower tray would be used to store things that you’d want to lay on their side, like Dreadnoughts and other bulkier models. 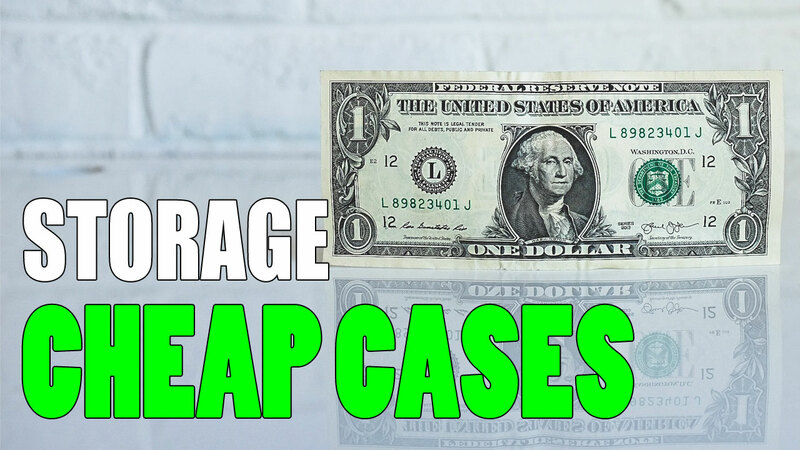 This tiered approach lets these cases store more than you would expect for the size. This thing is waterproof, drop/impact proof, car-proof, and more. Seriously, they did a video showing this. The case itself contains 3 of the tiered foam trays, making it the 2nd largest case, however, it’s easily the most durable. The 2nd smallest of the Citadel cases, the Battle Figure Case comes with 2 of the tiered foam trays. So, twice that of the Skirmish and half of the Crusade case. Even with just two of the trays, it can hold up to 200 Space Marines. That’s pretty impressive for the price. Dimensions for the case are 12.9 x 10.8 x 9.2 inches. So, it’s not too big, easy enough to carry around, and holds up very well to damage. This is a great case for someone new to the hobby and building up their 40K army. This case comes with 4 of the 2-tier channel foam trays. Effectively, that’s like having 8 trays in there, and all in a small space considering. Dimensions are It’s 18 x 11.5 x 8.5 inches. 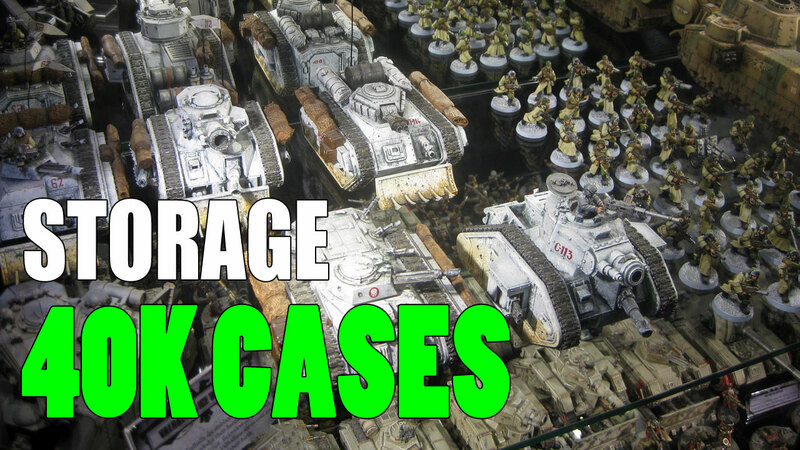 This is the 2nd largest of the cases and probably big enough for most people’s 40K armies. I do have a review of the Crusade case as well if you’re after a bit more information on the case. The smallest of the 40K cases (and most affordable), the Skirmish Figure Case can still hold quite a bit. I’ve seen some people saying they can get around 60 infantry models in there. So, it’s got more room than you’d expect for the size. That channel foam really does save some space while giving you storage. Speaking of, the size of the case is 16.3 x 10.6 x 5.1 inches, making it super light and easy to carry around. I have a review of the Skirmish Figure Case if you’re interested in seeing a bit more of a breakdown on it. This is a great intro case for any new Warhammer 40K player. A newer case from Games Workshop is the Warhammer 40,000 Carry Case. This is a very small case. In fact, it only fits up to 20 miniatures. The case comes with a single channel foam tray. Something this size is perfect for Kill Team, or even Necromunda. It could also be great to bring along with a normal sized case to carry special models you’re more afraid of damaging. You won’t carry around an army in this, but it’s a good looking case anyway. I just recently stumbled across these folks, Enhance. They’ve got an interesting take on the traditional carrying case too. The big thing you’ll notice with this case is the design. Honestly, it looks more like business luggage than it does a miniature carrying case, and I like that. The case size is 15 x 7 x 12 inches and will hold up to 108 miniatures in the 4 layers of pluck and pull foam that comes with it. Model storage aside, this features a book sleeve for your rulebooks, and also a good sized side pocket for accessories like dice, measuring tape, etc. The case is highly durable and even comes with a 3-year warranty. I think it’s the only case I’ve seen with such a warrant. Considering everything this case has, including the foam that comes with it, the price is extremely fair. Lots and lots of choices with Feldherr. So, I’ll just hit some high points with these folks. If you’re just after some trays then Feldherr has pluck trays. You can snag an 11.8 x 11.8 x 2 inch tray at a very good price. You can also find even larger, like a 13.6 x 10.8 x 4 inch tray. That’s a damn big tray! Feldherr also offers a wide range of pre-cut trays as well for various games, and also generic sized trays perfect for 40K models. Feldherr also offers bags with trays loaded, like the MEDIUM 135 case. The trays will fit 135 miniatures and at a damn good price if you ask me. They’ve even got a smaller one (and cheaper) that fits 32 models, the Feldherr MINI 32. Probably too small for most 40K players, but I figure it’s worth mentioning for those on a budget. If you do some digging around you’ll find a lot of choices available. Game Plus has some no-frills pluck trays that they offer. Here’s a tray that’s 10 x 8 x 3 inches, so a perfect size to fit into Sabol bags, and other standard sized bags. There are other sizes also available. It looks like Miniature Market has a good selection of them on their site. Also, Game Plus has a backpack style carrying case that’s a pretty reasonable buy. If you need some replacement trays for the Citadel cases then KR Multicase has some of those too. Anyway, these folks have a very large selection of products. You seriously just have to browse through their site to find what you’re after. The downside, honestly, is their site. It’s dated, a bit cumbersome, but they do have some nice trays at a reasonable price. I’ve only recently stumbled on Prime Time Foam, but they do seem to have a good choice of foam. They’ve got a pluck 4 inch tray (7.5 x 13 inches) that fits in standard bags, like Sabol, for very cheap. If you prefer the pre-cut route, they’ve got a 2 inch tray (7.5 x 13 inches) that holds 40 minitures. Perfect for your rank-and-file dudes. The’ve also got a 1.5 inch tray, a 3 inch tray, and much more for pre-cut trays. Then we come to Sabol, a name known by most for pluck foam trays and ArmyTransport bags. Sabol covers the gammut when it comes to trays, like the 2.5 inch tray (7.5 x 13 inches) that’s great for things like Dreadnoughts and bulky models. You can get the 2 inch tray, or maybe you want the 1 inch tray for your basic 40K grunts. For even more choice, hit up their site. There’s too many options to list here. Sabol is a great choice and easily one of the best foam tray companies out there. I learned about this company from an author on my other blog, so my knowledge is limited to that. Still, they have some good stuff (from what I was told). The prices do seem on the high end, but I’ll let you be the judge of that. This is their basic figure case, The Squire, and also the most affordable. The case itself is a lightweight and durable plastic. The box size is 15 x 5.9 x 11.8 inches, so pretty standard. The four trays would be great for infantry. Stepping up a bit, Tabletop Tyrant also has a more traditional bag with foam trays. The bag measures 15 x 11.8 x 11.8 inches, same as the above case, but the carrying bag is a typical fabric. This one comes with 7 trays total, 6 for infantry, 1 vehicle tray, and 3 cover trays. You can stash 8 tanks and 216 infantry into this sucker; not bad. A pretty reasonable buy considering as well. Tabletop Tyrant has a few other cases as well, though they only get pricer, but you can check them out anyway. There we have it, a list of companies where you can get foam trays for Warhammer 40K. There’s no doubt more than I listed and found, so if you have any I’ve missed then please let me know in the comments and I’ll add it to the list. I have a list of more miniature cases as well, that aren’t specifically for 40K, that will certainly work. Also, on my other blog I have a great article on ways to save money on Warhammer 40K if you’re interested. Now, if you’re in the market for paint storage racks as well, then I’ve got you covered. I cover the different options available with a range of prices from affordable to expensive, depending on your tastes.